In this article we are covering TaxAct Free file service which is also a part of the IRS free file alliance. 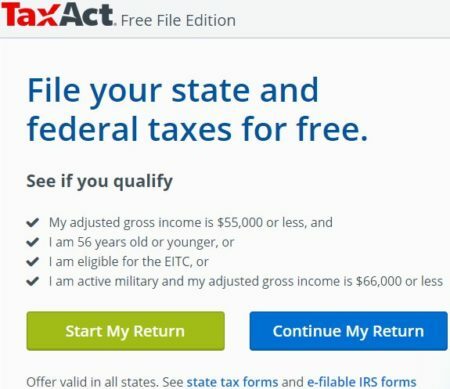 Earlier we have covered 3 free tax websites from where you can file your tax return for free these websites are 1040.com FreeFile Edition, H&R Block Free File, and TurboTax FreeFile program. Now we are covering another website which let’s you file your tax return for free if you qualify their eligibility criteria. TaxAct Free File service also offers you free state returns along with federal tax return. Let’s start with going to this website free file page, the link to the website can be found at the end of this article. You will be shown the qualifying conditions for a free return. If you qualify, click on the start my return button. You will be asked to create an account on the website using an email address, username, and password. You will be asked to verify your email address by entering the pin number emailed to you. Once you log in, you will see your dashboard as shown in the screenshot below. Now you will be asked if you filed your tax return last year with the website or not. If not click the button which says start as new user. Then you will be asked if you want to import last years return via PDF. You can say yes or no for this. 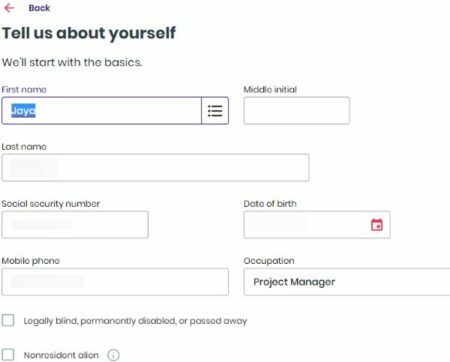 If you say no you will move on to the next section where you start by entering personal information about yourself like name, date of birth, social security number, occupation, etc. Click the continue button to move on to the income section. Here you will be shown a list of items which can be included as income on your return. 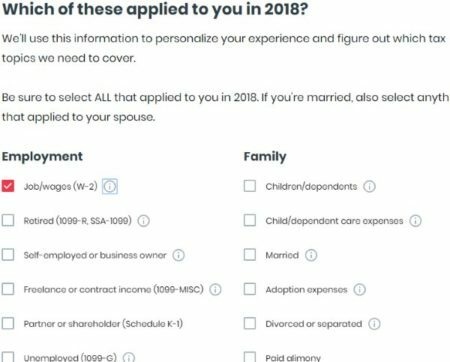 Check the check boxes next to each item which applies to you like W-2, unemployment, children, dependent, moving expenses, alimony, healthcare, etc. Click continue and you will be asked to enter your address. Next page you will be asked to select your filing status. The one which the website finds appropriate will be marked by default. But you can change it if you want to. Now you can go ahead and enter your income details that is your W-2 details in the format given. As soon as you enter your W-2 details a refund amount will start showing up on your screen top right side. After entering W-2 information you can move on to other sections like healthcare, deductions, etc. 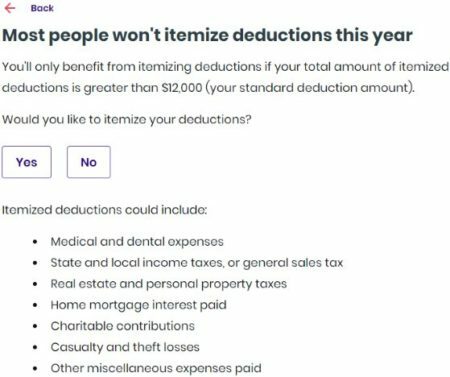 At the end of the section you can decide whether you want to take up standard deduction or itemized deduction. Itemized deductions usually are business expenses, real estate, property tax, charitable contributions, etc. If you have a simple return then go with standard deduction. Next we move on to the earned income credit section. You will be asked a few questions which you can answer accordingly. If you qualify for this credit then your earned income amount will be shown next. Answer all the questions as asked and at the end it would show you a summary of all the credits. Red Alerts: is for incomplete or inconsistent information. 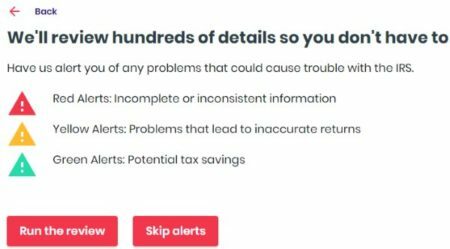 Yellow Alerts: is for problems that lead to inaccurate returns. Green Alerts: potential tax savings which you overlooked. Click on run the review to check your tax return so far. Once you have reviewed your return you will be taken to the final 3 steps of your return. 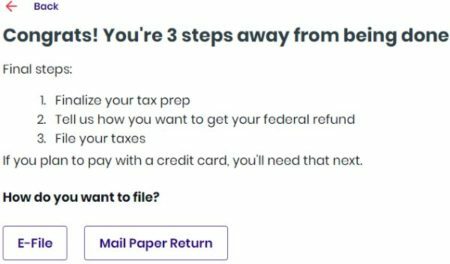 First one is to choose how you want to file your tax return. Do you want to efile or do you want to send in a paper return. Now you will be shown the price of your tax return. If you qualified the free file criteria then this return is free for you. Then you will be asked how you would like to receive your refund, through paper check or direct deposit to account. Choose and move to the next step. In the next step you require a driver’s license, state ID of yours or your last years return copy. Fill in the information as asked and submit the return for efiling. Do remember that the return is free only if you qualify the given criteria on the website. All other returns can be filed at a very nominal charge. TaxAct Free File service is easy and quite accurate. You can follow the step by step guide easily and keep answering questions. At the end you will be shown a refund amount or the amount of tax you owe. 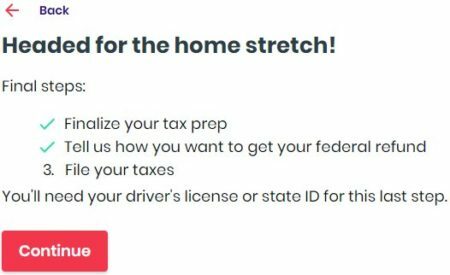 You can try this website out to file your taxes for free. Check out TaxAct Free File service here.